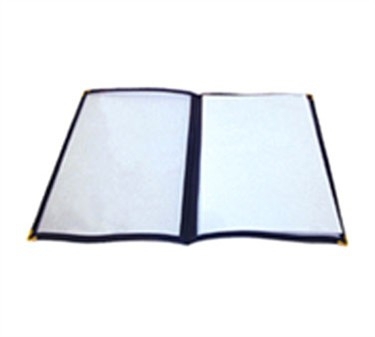 Showcase your menu options in the Winco PMCD-9K Black Double Fold Menu Cover 9-1/2" x 12" This menu cover has two pockets that feature four clear panels with a black vinyl double-stitched border and classic brass corners. You can insert paper menus of any design into this menu cover to create simple yet appealing menus for your clients. They can also be updated and changed as needed to keep up with price fluctuations or seasonal changes. Your menu will have visual appeal in this classic, clean, sanitary menu cover that is easy to clean and durable enough to withstand multiple uses.